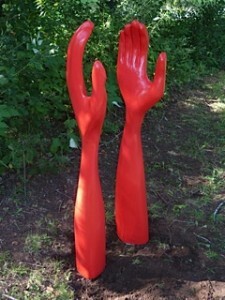 Here is a new piece I call “Red Hands.” It stands 4′ tall and was carved out of some recycled hemlock beams. 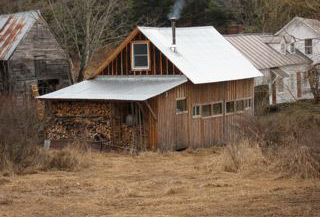 Given the state of the world and even Vermont’s, in the wake of Irene’s devastation, there are many who could use a helping hand. 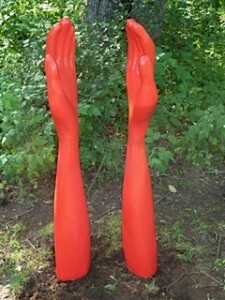 This piece could also be about the earth’s suffering at our hands. Hopefully viewers will be provoked to think about other stories these hands tell. 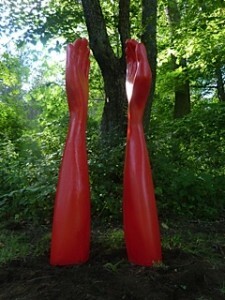 It is a joy to continue to show work at Sculpture Fest in Woodstock, Vermont, where I am given the freedom to site my work. My life continues to be an unpredictable journey in which I strive to maintain a balance between creativity and sustainability, or what sometimes feels like a choice between the practical and the impractical: Shall I grow food or make art? Can growing food be art? What am I called to do in this life? What really matters? As we find ourselves on the edge of either a “great turning” where humanity realizes it’s potential and enters a new type of enlightenment and prosperity, or we plunge off the cliff toward mutually assured destruction because of greed and short sightedness, such questioning seems all the more poignant. Being an optimist, and having brought children into this world, I believe we have no choice but to try to make the world a better place. For me that sometimes means growing things in my backyard, empowering others to be creative or making something beautiful out of stuff that’s been thrown away. It’s why I have been living in an eco-village for the past decade and have struggled to find a balance between self, family, and community.